“My Integrum” service performs 24/7 automated monitoring of many thousands of newspapers, magazines, news wires and other mass media in Russia, Ukraine and the FSU. Customized News feeds are set by the Integrum personal manager to meet customer's interests. The research tool allows to track mass-media publication trends on particular topics and arrange them by region, time interval, print run, audience and the ratio of negative to positive publications.The News feeds are updated and available online. 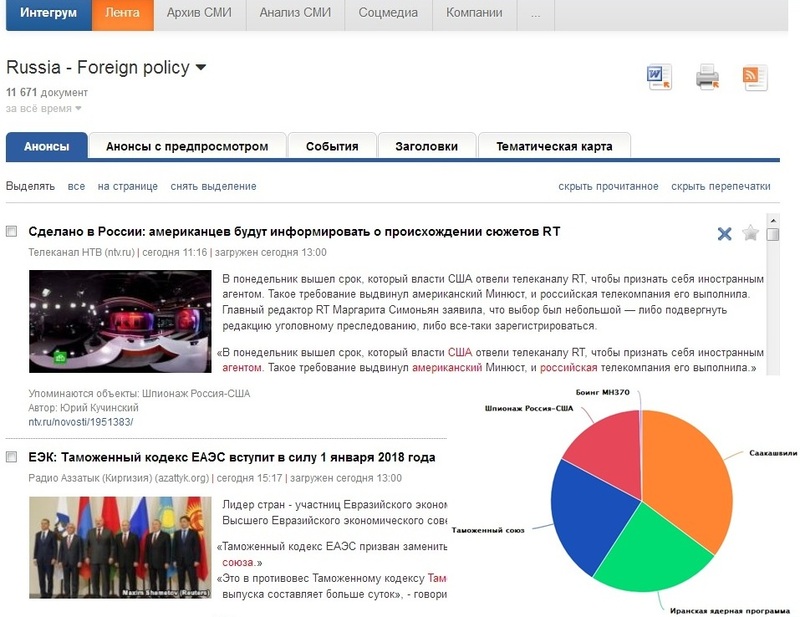 Besides customized News feeds the service includes Media Analysis with ready-made analytical reports in form of diagrams and tables and unlimited access to the mass media archive of Russian press (over 40,000 mass media titles). • to evaluate the readership of selected publications. To get more detailed information on this service please download My Integrum presentation in Power Point format (855 KB), My Integrum leaflet in PDF (170 KB) and My Integrum user manual in PDF (943 KB). If you wish to receive more detailed information on the Integrum services, as well as the subscription options, or free trial access, please contact us at support@integrumworld.com.